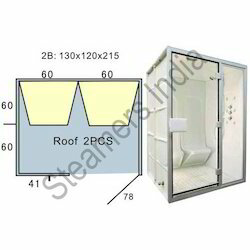 Being amongst the acclaimed organizations, we are dedicatedly engrossed in offering a wide range of White Steam Rooms that is tested strictly by our quality controllers. Steam bath facility available for members. With fully functional changing rooms including Shower and lockers . Separate steam rooms available complimentary to members. There are exquisite locker rooms for ladies and gents to keep their belongings while they are in the gym. Members are given free lockers, towels and hair dryers for their use. Size: 16" x 6 1/2" x 12 1/2"
We offers a broad selection of Steam Bath units, Steam Generators, Controls and Accessories for any health club, fitness center, hotel, tennis/ racquetball club, day spa or other “commercialas well as "home" facility that wants its customers to enjoy the convenience and benefits of on-site steambathing, ..